Browse Cub Foods Weekly Ad Circular, valid April 18 – April 24, 2019. This Week Ad best deals, and grocery savings on: USDA Choice Beef Ribeye Steak; Alaska Sockeye Salmon; Vidalia Sweet Yellow Onions; Hass Avocados; Red, Yellow or Orange Bell Peppers; Fresh Asparagus; Keebler Chips Deluxe Cookies or Sandies; Green Mountain Coffee; Dove Shampoo or Conditioner; Hungry Jack Pancake Mix; Pompeian Olive Oil; Yoplait Original, Light or Whips! Yogurt; Seedless Green Grapes; Kellogg’s Special K Cereal; Imagine Organic Broth; Wild Alaskan Sockeye Salmon Fillets; Del Monte Jumbo Golden Pineapple; Fresh Green Beans; Bumble Bee Chunk Light Tuna; Arctic Shores Tilapia Fillets; Arctic Shores Bay Scallops; Mars Single Candy Bars; Purina Beneful Dog Food; Pantene Shampoo or Conditioner; and more. 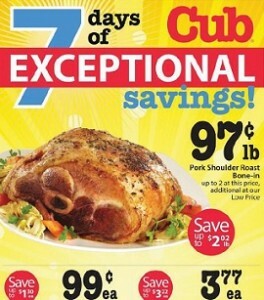 Find all deals, offers and prices in the latest Cub Foods Weekly Ad Circular.